My parents bought a microwave back in the mid 70's (IIRC). It weighed a ton and occupied 20% of my mom's counter space (avocado green). You know what? It still works. They used it regularly through the 90's. When they moved into a new house, it came with a new microwave among other appliances, so they put the relic in storage in the basement. It does still work though......unevenly heated food just like back in the day. Like all things, it depends on when you bought it. The one in my kitchen that I use evert day is a Sharp carousel. I remember when we bought it at MACY's... in 1982. Ours was already in the house when we bought it in 1992. It was well used then so I can't know for sure how old it is. We have been using it for 27 years so if I had to guess, I would say it is around 35 years old. GE. The only issue it has is the led timer lights have gone dim enough that you can't see them with the kitchen light on. Turn the light off and they are very readable. You guys do realize that even though newish microwaves don't last longer than 10 years +/-. We have a Sharp that is 14 years old. When it dies I will have no complaints. I bet that thing gets used 20 or 30 times a day. .....never marry a woman who is mean to your waitress. our Panasonic we got as a wedding gift 10 years ago. we have not had one last over a year for many years. For anyone wondering... I just ordered the Whirlpool. Well, the Amana is the same size, and would fit my built-in, but it was on back order. So I went with Whirlpool. We also owned a Sears Kenmore that lasted approximately 30 years. 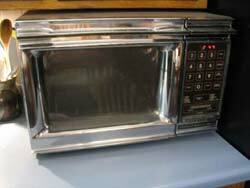 I have a Kenmore countertop microwave that is over 12 years old and running strong. More blessed than I deserve. I don't remember when I bought my microwave, but it was probably soon after I moved into my townhouse. I've been here 35 years. Wouldn't the life be at least somewhat dependent on how much use it gets? There's a cult following for the original Radarange models. They lasted forever. Probably more likely WHO has used it. The one in the work breakroom probably has a short life. My parents bought an Amana Radar Range back in the '70s. It still works fine. We bought a counter top Panasonic in the '80s and it lasted about 9 years. Then an Amana under the counter model, it lasted about 9 years too.